I heard a screenwriter raving about Adobe’s screenwriting tool, Adobe Story. I use GoogleDocs to store and edit the scripts for my video projects, but I’m always looking to see if a new tool can do a better job. Adobe Story comes free with CS5.5 Production Premium, so I opened it and tried it out. The logo looks happy. The experience was not. I watched a few tutorial videos that popped up. I created an account, signed in, and uploaded a Word document containing the script for a promotional video I’m working on. Good Lord. All line breaks were removed. Pressing “enter” didn’t didn’t add a line break, either. The text didn’t continue from one page to another. Instead, it disappeared into the bottom margin of the first page. I considered using the service solely to store and share documents. So I downloaded the iPhone app to my phone. I signed in and clicked on my script. I know very little about screenwriting, so I’ll blame it on that. In any case it’s [happily] back to GoogleDocs for me. Sorry I ever doubted you, GoogleDocs. Here’s a great little secret I’ve been using for the past few years. The folks at motionloops.com have a good selection of background graphics to liven up a video. I frequently use their graphics to add some motion to a full screen graphic, or an OTS box. The files are available for direct download, in a variety of formats. They’re not quite where they should be with HD offerings — most files are standard definition. But if you use these files like I do, stretched across the background with about 50% opacity, a bit of a Gaussian blur usually fixes any resolution problems. Here’s the best part. Motionloops.com has a weekly newsletter you can sign up for. If you’re willing to put up with a weekly email, you’ll find a FREE weekly loop at the bottom of those emails. And the free loops aren’t always awful. I’ve been downloading those free loops each week for years, so I have a decent collection. Everyone subscribing to the weekly email received a coupon a couple of weeks ago for $40 worth of downloads. Free. Not bad. That kind of stuff has made motionloops.com my go-to site for motion graphics, even though some sites may have better offerings. The down side? 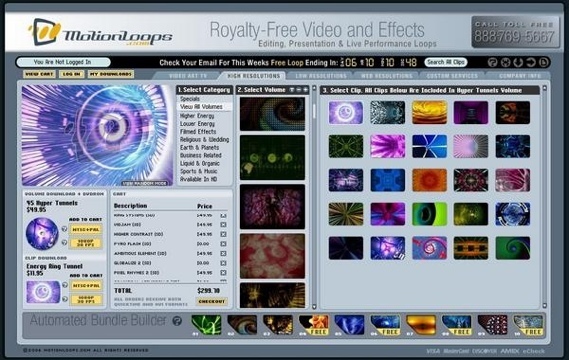 You’ll find Motionloops.com‘s selection limited once used them for a year or two. And their flash-based interface can be clunky. In any case, it’s hard to beat the free weekly loops. Here’s a lesson I’m still learning. I usually stick to the old adage, “if you want something done right, do it yourself.” Working as a one-man-band for all those years in TV news only enforced that rule. I’d simply rather do most things myself so they’re exactly like I want them. And I won’t have to blame anyone else when/if it doesn’t work. But there are some great ways emerging online to outsource the parts of a big project you don’t have the skills — or time — to do yourself. Here’s a video I produced to promote career fairs to potential employers. There were several key statistics the client wanted included, such as security clearances, education levels, and military experience of job candidates at these career fairs. I wanted to present these visually rather than listing the numbers on a full page graphic. I could have created a pie chart and given it some slight 3-D animation in Premiere Pro or AfterEffects. Anything beyond that would have taken a good deal more time. Instead, I turned to a site called VideoHive. They sell footage and motion graphics to use in projects. It’s all royalty-free, which makes it even better. A quick search for “charts” pulled up 18 results. I chose the InfoGraphics package. For $25, it was not a bad deal. What I bought was AfterEffects compositions, ready for me to insert my statistics. You open up the project in AfterEffects and follow the instructions to customize the charts with your own numbers. The instructions were easy to follow, and I was super happy with the result. These compositions were well made, using a variety of expressions (something I know terribly little about in AfterEffects) and effects. I knew just enough to be able to tweak the end result a little. The final effect gives this project exactly the feel I wanted. Something visually interesting and unique. I added some spotlight effects in Premiere Pro to most of my video footage, to reinforce the polished, edgy look of those charts. Point: don’t be afraid to outsource some of your work. There’s always someone who knows more than you… don’t be too proud to use their help! In the 10 years I’ve been working with Premiere Pro, I have not once been able to remember how to export a project with an alpha channel. Every single time I have to look it up. The process and options change with every version, and from PC to Mac. Here I am, again, trying to figure out how to export in full HD to Quicktime, and include an alpha channel. One of the most important things I learned from television news is that 20 seconds can be exactly how long you need to tell a story. That process of whittling away the things you can do without became something I really enjoyed. It makes for clearer, more effective storytelling. The danger of online journalism is that there is usually no time constraint. A story can be as long as it needs to be. But they seldom are as short as they need to be. It’s harder to tell a story in a shorter amount of time. It’s harder to provoke emotions using fewer words or images. But it’s the difference between a good storyteller and a great storyteller. Too often I find my stories good, but not great. Each time I go back and look at a story I produced, I notice things that could be removed. Ways to shorten it. Ways to be clearer and more concise. For example, take this promotional video I produced for a Wounded Warrior event in DC. The goal was to tell a story, then promote the event. I think it accomplished those goals, though not in the most effective way. I would have loved to get it under 60 seconds. The great thing about watching those stories is that they remind me to leave more on the cutting room floor next time. I’ve made enough mistakes to realize: just when I think it’s “done,” it should probably be edited down at least another 20%. You don’t want to sacrifice the story, but in most of these cases less really is more.